Potentially massive spoilers for Captain America: Civil War ahead. You've been warned. Those closest to the film, such co-directors the Russo Brothers, have been promising a pretty serious tone for Civil War. At this point, it’s just a guessing game as to which character will likely be biting the dust in the final battle. Well, it now appears that we may have that answer. A detail oriented redditor has taken a closer look at a frame in the newest trailer, where it may be revealed that a certain character is dead. Take a look. That’s right, something is going to go down with Bucky aka The Winter Soldier. 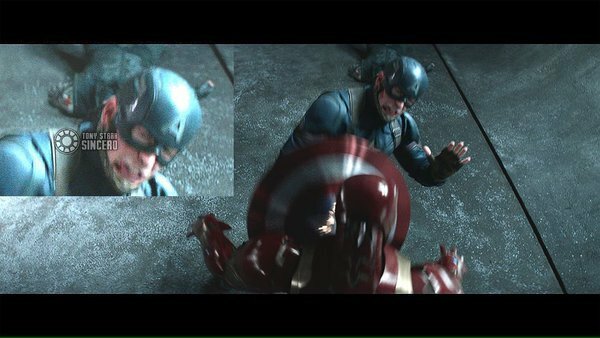 In this image, we see a possibly dead Bucky Barnes on the floor while Captain America and Iron Man exchange blows. What’s more, Bucky has been stripped of his metal arm, which I’m going to assume wasn’t the most comfortable of experiences. Did Iron Man physically rip the arm out of it’s socket? I’m going to say it’s a strong possibility. We all know that War Machine aka James Rhodes is going to get seriously injured during the events of Civil War. In the recent trailer, we’re shown Rhodes plummeting downward after being struck by what seems to be Bucky’s gun. We’re then shown Iron Man flying down to his unconscious (or dead?) body. Since Tony Stark’s best friend got messed up, it seems like he wanted to return the favor and make Steve Rogers feel the same pain. Now the real question is whether or not Bucky will be coming back from his injury. Since we’ve been told that there will be some loss in Civil War, I’d say it’s entirely possible that Bucky is doneso. Civil War will see Steve and Bucky reuniting, which is sure to be satisfying for those of us who saw The Winter Soldier. However, where exactly could Bucky go from there? His inclusion into the Avengers seems a little far fetched after the Civil War for which he was a contributing factor. Instead, Bucky’s potential demise could help truly change the character of Steve Rogers. His happy bubble will be popped, and he’ll be able to descend into a more gritty place moving forward. It could be exactly what the character needs to stay fresh and exciting. All will be revealed when Captain America: Civil War flies into theaters May 6th, 2016.